"Through the years, I have frequently had an uncomfortable feeling that the portrait of Jesus I found in the New Testament didn't fit with the image of Jesus in the church. I'd like to share my search with you, and invite you to be part of it. 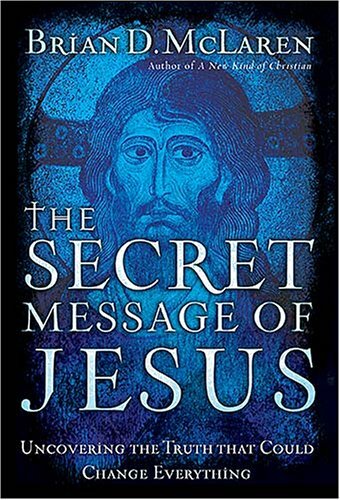 I don't want to spoil the ending, but I'll let you in on this: the farther I go on this search, the more inspired, moved, challenged, shocked, and motivated I become about the secret message of Jesus... If we succeed in grasping even some fragment of Jesus's secret message, if we take it in and manage not only to look at it but also learn to look through it, my hunch is that our world nd our lives will look very different to us at the end of our exploration. And if that happens deeply enough for enough of us, everything could change." Sweet! I am also reviewing the book and will post it on my blog and elsewhere. I look forward to hearing your take.